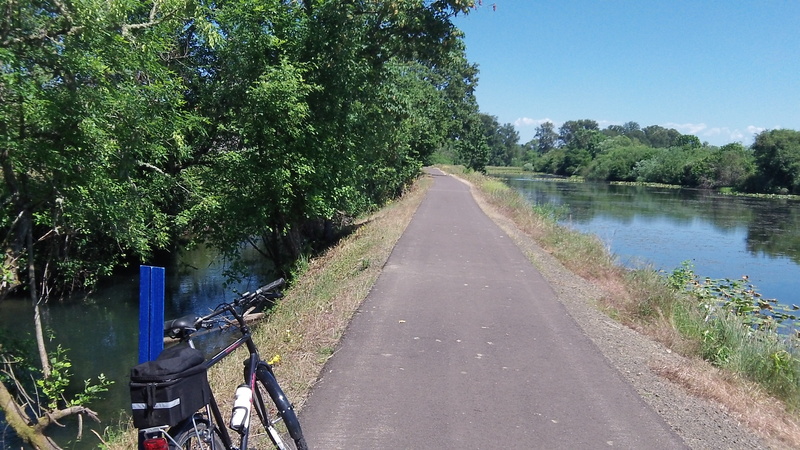 The Santiam Canal, left, runs past Cheadle Lake in Lebanon. The war of words between Albany and Lebanon over the Albany-Santiam Canal has calmed down, thanks at least in part to the public works professionals of both towns. As a result, it’s now possible to envision an agreement that meets the goals of each, and the hope is that the respective city councils see it that way too. The issue in the long-dispute is how much Lebanon should contribute to the upkeep of the 18-mile canal. Discussions reached a low point a few weeks ago when Albany demanded that Lebanon quit pumping canal water to augment Cheadle Lake or it would remove the pump, and Lebanon responded by threatening to cite for trespass any Albany crew attempting to so. Shortly afterward, Lebanon City Manager Gary Marks offered a compromise. Albany City Manager Wes Hare initially scoffed at it, but then he called Marks with a suggestion. As a result, public works officials of both cities met on June 17. According to a joint summary of that meeting, the staff members had a perfectly reasonable discussion and reached some tentative agreements. The Albany council talked it over in an executive meeting on June 22, the substance of which became public when Jeff Blaine, Albany interim public works director, wrote to Ron Whitlatch, his Lebanon counterpart, on June 26. “The council,” Blaine wrote, “was generally willing to consider waiving claims for past capital contributions if Lebanon will commit to spending $1.2 (million) to reduce its current storm water contributions to the canal.” Because of flooding and potential problems with pollution in the water supply, the amount of runoff entering the canal from a part of Lebanon has been of concern to Albany — and according to Lebanon’s wastewater master plan to Lebanon too — since the 1980s. Beyond reducing the current canal inflow during heavy rains, Blaine’s letter proposed that the cities also negotiate ways to prevent additional flows from future development. These might include water detention facilities of the type already required under current state and federal clean-water rules. — Lebanon would continue to draw water from the canal and pay Albany $133,000 a year as its share of operations and maintenance costs until Lebanon’s planned new intake on the South Santiam comes online. — Lebanon and Albany staffs would spend a year to reach a mutually agreed-upon plan on the most effective ways that Lebanon’s $1.2 million could be spent to reduce stormwater inflows. The improvements then would be done over five years. — Albany would agree to support Lebanon as it seeks water rights and permits for its new intake on the river. Once the new intake and treatment plant are finished, the connection from the canal would be shut down and the canal wall sealed.